The Hillsdale Morris Daybed is perfect for any elegant home, whether small or large. Its sleek metal frame features a Magnesium Pewter finish, which is a sophisticated leaden silver finish that looks great with any grayscale color scheme. The combination of straight lines and curved arches on the back and sides creates a beautiful Transitional silhouette, which allows it to complement many different decor styles. This adaptability of design means that you can put it in any room and it will blend, making it one of the most useful pieces in your home. 3 Great Daybed Mattresses to Choose From! The Classic Brands Cool Gel 6 Inch Gel Memory Foam Mattress is a fantastic all around choice in the daybed category, this mattress provides firm comfort and support, and is 100% compatible with all daybed trundles! 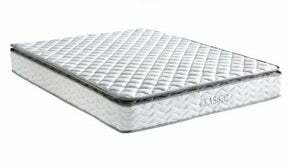 A step up from the 6 inch model, the Classic Brands Advantage 8 Inch Innerspring Mattress provides enough comfort and support to promote a cozy and supportive sleep experience. The top of the line! The Classic Brands Decker 10.5 Inch Firm Hybrid Memory Foam and Innerspring Mattress has enough comfort and support to be used every night, without issue! Care Instructions: Dust frequently using a clean, specially treated dusting cloth that will attract and hold dust particles. Do not use liquid or abrasive cleaners as they may damage the finish. Height: Side: 34.5" Back: 42", Width: 79", Depth: 39"
Assembly Required: Yes. Easy to assemble, simply attach the back and sides to the polytop frame. We deliver anywhere in the continental United States that is road accessible. If you live in Hawaii, Alaska or a location only accessible by ferry, please contact us for shipping prices. While we do not ship internationally, we can deliver to your US based freight forwarder. Please note, special delivery options, including Hawaii and Alaska deliveries, cannot be added to an order once it is placed. For more information on delivery or to select one of our special delivery options, please call us at 1-800-279-3775. If ordered, your mattress(s) will ship FREE via UPS ground in approximately 3-7 days and will arrive separately. Everything about this daybed met or exceeded expectations. It is good looking, well made, sturdy and easy to assemble. I highly recommend it. Arrived in great condition. Easy to put together. Bought the pop up trundle and it is so much fun for the granddaughters when they sleep over. I would buy it again in a minute. ProsLove the color and shape. ConsIt took about two weeks for it to arrive.